The American Poets - "Hurt"
There is a narrow divide between acting and singing. Great actors crave great roles and great singers crave great songs. Both are storytellers who bring to life the words and music of writers and composers—with one big difference, the singer has the added burden of interpreting the music as well. Every songwriter knows that the words and music can never be any better than the singers who sing them. When a song is really good, bringing together that just-right combination of words and music, vocalists will line up to take their shot. It is that mystical confluence of performer and role that makes a career, providing the singer and the song with an open door to immortality. Rosemary Timothy Yuro was born in Chicago, on August 4, 1940, into an Italian-American family. By the time she was twenty-one she had found her song. The song “Hurt” was written by Jimmy Crane and Al Jacobs and was originally recorded by Roy Hamilton, the smooth-voiced R&B crooner of “You’ll Never Walk Aone” and “Unchained Melody” fame. His own version of “Hurt” peaked at no. 8 on the R&B charts in 1954 and remained an underappreciated classic. 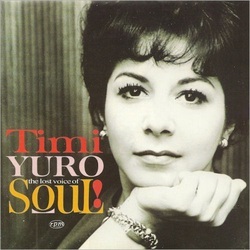 Seven years later, in 1961,Timi Yuro stormed onto the scene with one of the greatest bravura performances of the era, turning the Crane/Jacobs song into a classic, earth-shaking, two-fisted, blue-eyed, soul ballad. Her husky, smoky contralto, with its searing emotional edge, formed a perfect partnership with the words and music, creating what up until now was the definitive reading of the song. Ms.Yuro never again found another great role to play, although she had some chart success and performed in Vegas, opening for Sinatra, among others. But the Crane/Jacobs song lives on, and has been performed by artists as diverse as Elvis Presley, Marty Robbins and Carly Simon. Juice Newton scored a No.1 country hit with it in 1985, making it one of the very few songs to ever cross over all three, pop, country and R&B charts. Music, like all art forms, has a lineage. From Elvis and Roy Hamilton to Timi Yuro and Doris Day, these are just a few of the artists that have played the roles created by the songwriting duo—and now there are two more gifted performers we can add to that list. Jeff and Christine Maldonado are the creative duo behind the band “The American Poets.” Their first CD with the group is entitled “Light of Life,” which is a reference to the Gospel of John, Chapter 8, Verse 12. Full disclosure, I play trumpet on two cuts. (Note to Jeff and Christine, always, always bring the trumpet up in the mix!) Using great South Florida musicians, they have brought to life songs that clearly come from the heart. However, before going off on a rhapsodic review of the CD, let me tell you a bit about Jeff and Christine. Jeff Maldonado grew up in South Florida, taking private classical guitar lessons from teachers at the University of Miami. He attended the prestigious New World School of the Arts and then went to Los Angeles and studied at the Musicians Institute and Costa Mesa Community College, again focused on classical guitar. Christine Maldonado attended Miami Beach High School, studying under famed band director, Doug Burris. She then won a full scholarship to Miami-Dade Community College where she was one of the Wolfson Singers. Jeff had a couple of rock bands here in South Florida after returning from California. Christine worked at Spec’s Record Store, studied drums and played local gigs—also singing at North Creek Presbyterian Church in northwest Broward County on Sundays. In the late ‘90s, Jeff was hanging out at Warehaus 57, a now defunct club in Hollywood, Florida when he ran into Christine. It was fate. From that time to now, they have been inseparable. First performing as “The Providence,” they released a well-regarded acoustic set on CD in 1999. In between all of the gigs and recording sessions, they got married. I first came across these talented folk while enjoying Mexican food at the late, lamented Cancun Grill here in Hollywood, Florida. A funky, friendly place with excellent Margaritas, the Cancun Grill was a fixture in downtown Hollywood for many years. Jeff and Christine had a regular weekend gig playing there for several of those years. Hearing their beautiful harmonies, excellent guitar playing and percussion, I was knocked out. I couldn’t believe they were playing in a restaurant when they ought to be in major venues on tour. Getting to know them over the years, I learned that they were smart and capable folk who knew how to market their music. Nonetheless, in spite of a large local support base, they haven’t “broken through” to mainstream success. This is a real loss for the mainstream! Sitting down with Jeff and Christine, I asked them about the album and their inspiration for the various songs, all but one an original, within it. In a freewheeling discussion, I learned a lot about people I thought I already knew well. “Christine wrote that one,” answered Jeff. “I wrote it when I got my first apartment and was on my own for the first time,” Christine said, “It’s about…it’s about my friends and I, and the ways that we let ourselves lose our way pursuing unequal relationships. “You mean with guys”? I asked. “Yeah, Christine and I were just friends then,” Jeff said. Christine chimed in and said, “I wrote ‘Leaving Us Alone’ as a reaction to all of the negativity on the news. It's about how we are left alone to fend for ourselves. “Well, while it’s true that my grandfather wrote many songs, this is the one that always meant the most to me. I guess that I just felt it the most. What I wanted to do when I covered it was to bring out what I thought was the heart of the song. You know what I mean”? “Even though I love Timi Yuro’s version, I think I love yours more.” I said. Note to readers: Jeff and Christine are accomplished performers, but Christine’s singing on this song reaches something deeper than I’m accustomed to hearing from either her or Jeff. The heartache invoked by the lyrics is obviously felt by Christine’s “character” and she carries that heartache for all who have been rejected by a lover. Where Timi Yuro’s take on the song has the anguished force of a hurricane, Christine takes a cooler approach. Hers is the sorrow, the hurt of an abandoned woman trying to cope, to keep her head held high in the face of despair. On the verge of tears, but with a final declaration of “I could never hurt you” she determinedly carries on. It is quite a different approach to the song, which has almost always been done by others in the manner first perfected by Ms. Yuro and shows a different understanding of the song’s pathos. The exceedingly spare arrangement is an effective choice for highlighting Christine’s voice. She is, essentially, alone. Jeff volunteered that they both wrote the song. It was written as a gift to some friends for their wedding and was played by Jeff and Christine for the first dance at the reception. Laughing, we turned our attention to the next song. “So, let’s see what’s next. Oh yeah, ‘New Found Hope.’ Who wrote this one?” I asked. “Well, finally there’s ‘All I Ever Wanted.’” I said. By this time, Eija, their three-year-old son, was getting restless. He started singing the Beatles’ “Love Me Do” and I took it as my cue to leave. I said, at the beginning of this article, that “There is a narrow divide between acting and singing. Great actors crave great roles and great singers crave great songs.” The American Poets understand this. Their carefully crafted songs and the beautiful arrangements they use to bring them to life are the roles of a lifetime, incorporating as they do the emotions and experiences of their lives and ours.